Washington, DC — On Monday, November 21, 2016, food vendors from Union Market (1350 6th Street, NE) will close up shop early and come to the Mission to serve dinner for our men. Bringing a variety of choices to meet all diets and appetites, vendors will serve our Mission guests dinner in two seatings starting at 4:30 pm. In addition to donating the food, the vendors will also donate paper products as well as volunteer to serve the food themselves. 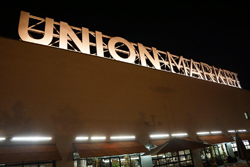 Union Market plans another meal service on December 19, as well as a used coat drive to keep our neighbors warm. Central Union Mission has held our annual fundraising event HeArt & Sole at Dock 5 at Union Market for the past two years; our guests enjoy this stylish and hospitable venue. Media are invited to attend. Please contact Deborah Chambers at 202-534-9965 cell or dchambers@missiondc.org to coordinate interviews with Union Market vendors, Mission staff, volunteers and guests.